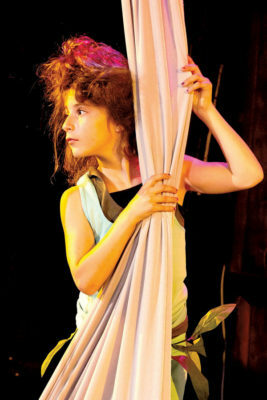 IARA NEMIROVSKY, former “Larchmont’s Got Talent” contestant, playing Ariel in “The Tempest” with the Los Angeles Drama Club. In October 2015, 8-year-old Iara Nemirovsky clambered onto the “Larchmont’s Got Talent” stage and belted out “Naughty” from “Matilda the Musical.” With great excitement, she landed second prize. The next year, she mounted the steps once more to sing “Gimme Gimme” from “Thoroughly Modern Millie.” Second prize was hers again. The play, which fist-pumps its way onto the Hollywood Pantages stage on Thurs., May 3, is based on the hit 2003 film of the same name. The high-octane musical features songs from the movie as well as an original score by Andrew Lloyd Webber, lyrics by Glenn Slater and book by Julian Fellowes of “Downton Abbey” fame. But getting to this place didn’t happen overnight. After Iara placed second in “Larchmont’s Got Talent,” she took her talent show winnings and headed to New York, where she met with acting coaches and auditioned for the Broadway musical “Matilda.” Although playing a role in “Matilda” didn’t pan out due to her young age, Iara was on their radar. Iara got a callback and then flew to New York for a final audition. Within weeks, she booked the part. From the moment Iara learned the good news, she hit the ground running. For school, Iara and the other 16 child cast members see on-set teachers and take online courses. While not on tour, Iara attends Citizens of the World Charter School. She spent her first years at The Plymouth School, a preschool near Windsor Square. Now, Iara is pouring all of those skills into the character of Summer. Iara’s national debut took place at the Kentucky Center for the Performing Arts in Louisville, Ky. on March 13, the day after her 11th birthday. Her first night on stage culminated with a 2,000-person-strong standing ovation. Iara may be lean in years, but she already knows which direction she wants her life to go. “School of Rock” runs from Thurs., May 3 to Sun., May 27 at Hollywood Pantages Theatre, hollywoodpantages.com.